Your records will be cleaner, your audit will be quicker, and your system will be more efficient if you regularly take care of master folios. Each type is dealt with differently. Every folio should have one of the following codes in the "Folio type" field and should have no other code unless expressly advised by Execu/Tech. CL = clearing folios such as POS master folios. 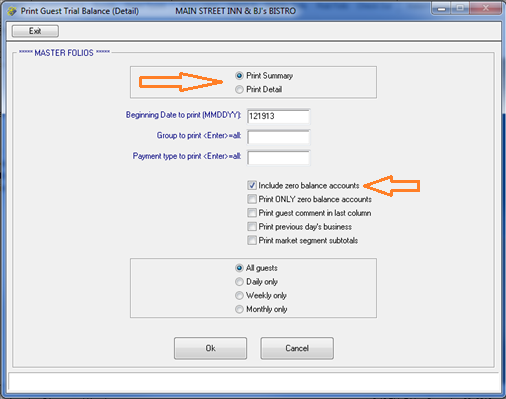 Print a Guest Trial Balance report. 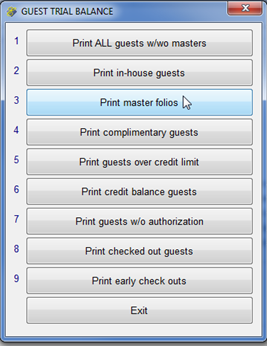 Go to the Night Audit menu or the Manager/Setup menu and select Print Guest Trial Balance. Select "Print Master Folios". 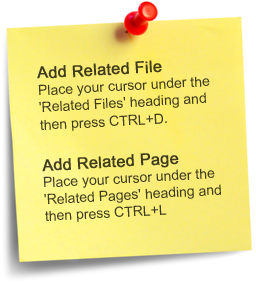 Click "Print Detail". Click "Include zero balance accounts". To display a folio, go to Display Folio from your toolbar icon or from your Front Desk Operations menu. Click "Display master folios only". Each master folio is handled differently. Specific instructions are below, depending on type of folio. 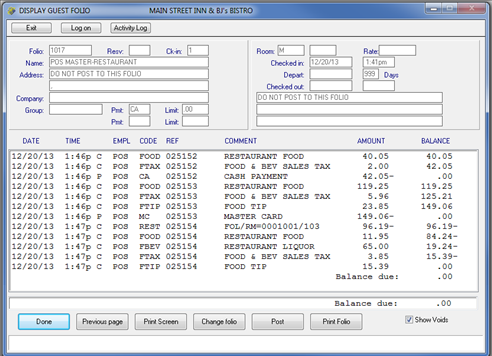 POS Master Folios and other clearing folios MUST maintain a zero balance and MUST clear at night audit Reorganize Files. Otherwise they will accumulate thousands of transactions, will become cumbersome and may cause file corruption. If you use Execu/Touch point of sale at your hotel, you will have a master folio for each POS outlet such as bar, restaurant, spa, and gift shop. If you do not know the master folio numbers and cannot find them from look-up, you can look them up in each POS Store Record. If each outlet is in a different company, then go into each company via System Maintenance > Select Another Company. You will need a hotel user ID for each company. From each company, go to POS Administrator > Store Record. Do this when your POS outlet is closed or the POS terminals are inactive. When the Store Record window opens, click the Hotel button at the bottom of the screen. A new little window will open. The master folio number will be the first field. Once you know the folio number, display the folio as shown above. As you see in the image below, the folio's balance is zero after each POS ticket is closed. If the balance is not zero you should ascertain the reason, post a transaction into this folio using the appropriate charge or payment code, and then fix the cause. The most common causes are an invalid revenue department code or a communication error. In the above folio, see the four transactions for REF 025153 which is a restaurant ticket for food, tax, and tip and was closed to MasterCard. There are three debit transactions (FOOD, FTAX, FTIP) and one credit transaction (MC) in the folio. The debits equal the credits. If they do not, you should determine which transaction is missing and then post that transaction manually. For example, if the folio balance is -23.85 then you would know that the payment exceeded the charges. To view the POS ticket, simply click the reference number. The POS ticket will display. You can then see that a tip of 23.85 was included but did not post to the folio. You would then manually post FTIP for 23.85 to the folio. The balance will then be zero. This is important for two reasons (1) your folio will be back in balance (2) your financial information will be accurate, including the amount of the tip. NOTE: Your night auditor or manager should check these folios each day. The Final Recap always prints a warning when any clearing folio does not have a zero balance. You should never post to this folio unless advised by Execu/Tech or unless posting a missing transaction as described above. 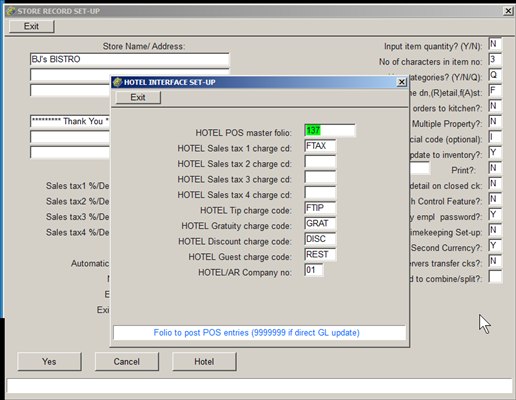 Most hotels use master folios to post administration charges, adjustments, etc. We recommend checking these folios out monthly or quarterly, depending on the volume. If the folios do not have a zero balance you should post the transaction(s) necessary to zero out the folio. Your accountant or manager can recommend the appropriate code to use. After you have checked out the folio you can check in a new one. You can use the same profile name or create a new one. To close a master folio go to Check-Out > Close Master Folio. To check in a folio go to Check-In. Check the folio in as a walk-in. See Master Folio Setup for correct procedures. After a group has departed or an event has finished you should post any remaining charges and payments, giving the folio a zero balance, and then close the master folio. To close a master folio go to Check-Out > Close Master Folio. If you have a recurring group and wish to keep the folio open you should check out the folio annually or semi-annually and check in a new master. If you check in a new master, remember to update the folio number in the Group setup screen. If any reservations are associated with the new group, click the "Update reservations" button and then select "Master Folio". Most hotels do not use master folios for wholesalers or direct bill customers. Most wholesalers provide virtual credit cards. Others are handled as direct bill accounts. Most direct bill guests are checked out with payment code DB with the charge transferred to city ledger (direct bill) at night audit. However, if you do use a master folio for this purpose you should post a DB payment to zero the folio and the close the folio. To close a master folio, go to Check-Out > Close Master Folio. You can open a new master folio if necessary. See Master Folio Setup for correct procedures. Cash sales master folios should be checked out monthly, quarterly, or annually, depending on the amount of transactions. Cash sales master folios should have a zero balance after each sale. For example, if you sell copier services, you might post a COPY charge of $12 and a CASH payment of $12,creating a debit and credit entry, as charges post as debits and payments post as credits. To close a master folio, go to Check-Out > Close Master Folio. You can open a new master folio if necessary. See Master Folio Setup for correct procedures. You should never post to this folio unless advised by Execu/Tech. It should have a zero balance at all times. If it does not, contact Execu/Tech. You should never post to this folio unless advised by Execu/Tech and only to make corrections. If you post to this folio it may not work correctly. You should never void a transaction in the Advance Deposit Master Folio. You should never transfer a transaction to or form the Advance Deposit Master Folio. This folio exists so that deposits posted into reservations can be "held" and then transferred automatically to guests at check-in. See Advance Deposits for information on handling cancellations, no-shows, and "name not found" deposits.